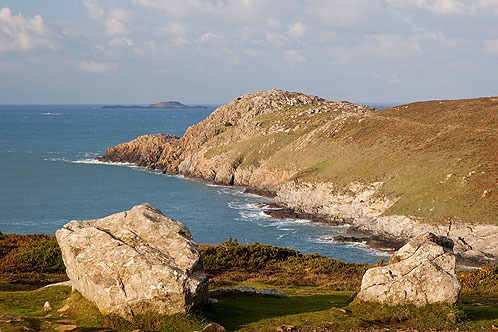 View passed glacial erratics from the last ice age above Porthmelgan , to St David`s Head . St David's Head and the coast to the east,(Penllechwen ) is composed of "Gabbro" and other closely related rocks . "Gabbro" formed when volcanic magma intruded into the Ordovician sedimentary rocks. The thermal contact also produced new metamorphic minerals in the sedimentary rocks , mainly "Garnet" and "Cordierite".